Nasima Parvien on the job at Goodwill. Photo courtesy of Nasima Parvien. 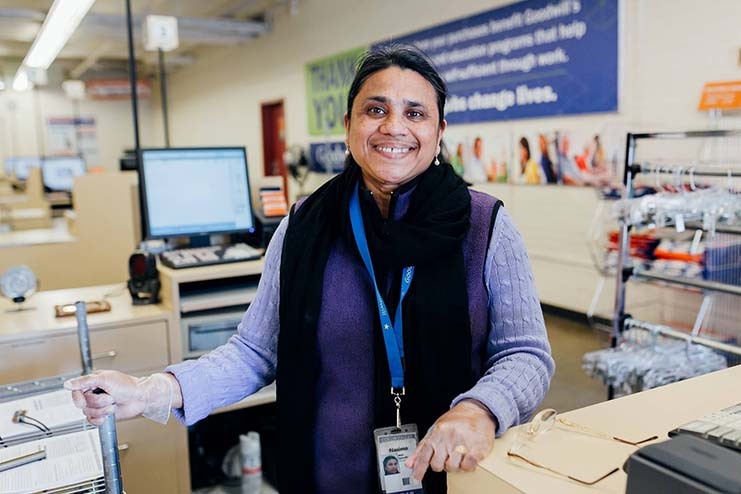 Nasima Parvien has lived in Seattle’s Columbia City neighborhood for 22 years and has had a successful career at Goodwill for the past 20 years in the customer service department. Her two kids, a 15-year old daughter and 24-year old son, both raised here in the United States, are making her a proud mother with their educational goals and aspirations and their ties to Bangladeshi culture. She shared her story with the IE about her experience as a first-generation Bangladeshi woman immigrant – recalling the earlier days, the cultural barriers and her hopes for the future. Parvien is originally from the city of Kushtia, which is a district in the western division of Bangladesh called Khulna. She came from a big family, consisting of nine sisters and two brothers. When she was five years old, she began living with her older sister, who for the most part lived alone due to her husband having a job that transferred him to different places quite frequently. This led to Parvien living in many different parts of Bangladesh as she was growing up, including Nator, Naogaon, Sirajganj, Bogra and Pabna. She said moving around so much with her sister and brother-in-law was an amazing experience, but it also led to some study gaps, which she had to constantly make up for. She passed her metric exam in 1986 and then attended Kushtia Girls College with a major in history. Shortly after graduation, in 1989, Parvien moved to Dhaka, the capital of Bangladesh, and started working at Paris International School as a teacher, where she worked until 1994. After this job, she went to visit her family in Kushtia for Eid al-Fitr, and during that visit, she learned that her marriage had been arranged by her family. It took a little over a month for the wedding to take place. Two and a half years after she was married to her husband Fareed, Parvien and Fareed immigrated to the United States from Bangladesh in October of 1997 with their son, Rupom, who was just a year and a half old at that time. Fareed’s older brother had sponsored all of his family to come to the U.S., and that is how they immigrated to this country. Parvien immediately wanted to start working, so she joined a daycare where her sister-in-law was the director at, in Columbia City. “I definitely had some adjustment problems, like most other immigrants. I had the language problem, and it took me time to learn about this culture, but having my sister-in-law right next to me helped me greatly,” she said. Two years after immigrating and working at the daycare, Parvien started working at Goodwill in its customer service department. Apart from work, Parvien enjoys cooking, decorating her home, exploring her city and spending time with her friends and family. Parvien is a proud mother of two who remain close to their Bangladeshi culture. Her son Rupom is now 24 years old and a graduate from UW-Bothell, and her daughter Ria, is 15. Both of the children speak Bangla fluently, and her son takes part in various cultural programs and events. He is also a musician and taught himself how to play the tabla, which is a pair of East Indian drums. Speaking the native tongue at home is very important to the family, and something they have kept alive in their own family’s culture. “As a family, we have made it a point to not ever work in the evenings; the evening-time is for family and we always spend time together then, whether it is by watching TV, eating snacks, or whatever it is that we want to do,” said Parvien. “My mom tried very hard and she always did the most that she could. She bought me my first computer in 2004, and her coworker came to teach me how to use it – that made a big difference in my life,” said Rupom. Parvien and her family go to visit Bangladesh as frequently as they can, and they have visited in 2000, 2003, 2005 and 2010. She believes that is the best thing they can do to stay tuned to their culture.